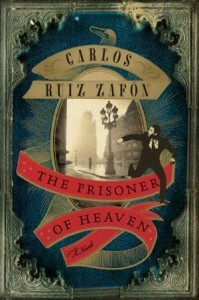 This entry was posted in books, fiction, historical, review, review copy, speculative and tagged gothic, reading, Spain. Bookmark the permalink. The Shadow of the Wind is one of my sister’s all time favorite books so she’s chomping at the bit to read this one. I gush over Zafon. Like you, I loved Shadow of the Wind, but I loved Angel’s Game almost as much. Prisoner of Heaven was a perfect addition to the collection. I’m sorry this one was only a 3.5 for you. Actually, 3.5 is a decent rating from me. Plenty of books I liked fine I give 3s to. I’m really stingy with my 5s. 🙂 Glad you love them, though! Nice review! I read this and really enjoyed how it fit with the other two, and I’m very excited to see how the fourth completes the set! My review is here: http://wp.me/p2s3sT-1F. Hey, Mike! Agreed, how they intertwine is definitely fun! Shadow of the Wind is my favorite of the three as well, though I did like this one a lot. However, I wanted it to be longer and as you mentioned, a little more magical. Oh yeah, I forgot to mention the length! This one was quite short compared to the other two. I think this contributed to my finding it a bit more simplistic. I’m glad you enjoyed it, I still need to read The Shadow of the Wind, I know, I know! I agree that the only real drawback to this one was in how straightforward it was. Still, I enjoyed how it filled in so many pieces of information that we never got in the first two books. I also loved what happened in the Cemetery of Forgotten Books at the end and hope that the fourth book actually goes in that direction a bit! I loved Shadow but still have Angel’s on my shelf. I need to get to it before I forget all the wonderful details.